Price: USD$100 available from 4+ N.A. The Focke Wulf 190D-9 was one of the finest aircraft of the Second World War. JaPo has produced the second volume in what appears to be a three volume set. A 475 page hardbound book which follows the production of the Dora, this book documents the development of the camouflage by the different manufacturers and the production batches. 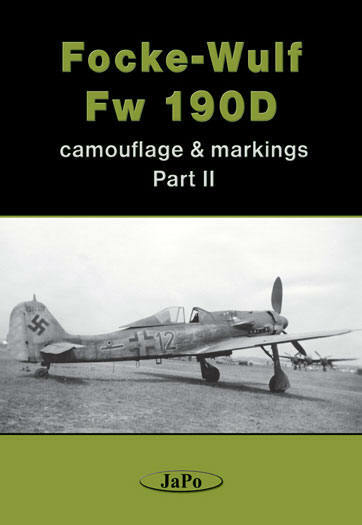 Following the production of aircraft by the camouflage patterns and work numbers, this book is an essential guide. The color drawings, of which there are numerous, are first rate. They are inspirational and generously provided throughout the book. There are many previously unpublished photos. Where they keep finding them is beyond me. The book is set up to follow individual aircraft through its use. Some aircraft are covered on two sides and some include all four sides. This is an impressive study and very in depth. One of the things that I found interesting is the use of RLM 76 as an upper surface camouflage color. Color photos are used to illustrate aircraft when they are available. There is no expense spared and you can tell that this is a labor of love for the authors. There are contemporary photos of aircraft components that illustrate the points being made on certain aircraft. This type of in depth review is essential for the historian and the Luftwaffe enthusiast. The discussion of the dreaded “RLM 84” is included due to its wide spread use on the Dora. Not only is the D-9 covered but also the D-11, D-13 and the D-15 prototype. A complete breakdown of the D-13 “Yellow 10” is included. Interestingly, the spinner is not discussed and the green color is not illustrated. This typifies the late war Luftwaffe paints and the interesting conclusions that have been or can be reached. The difference in production batches and the variety of colors makes for a lot of interesting schemes. This book has one of the most comprehensive coverage of the D-11s used by the Verbandsfuhrerschule. Drawings and test data for the D-14 and the D-15 are included. The D-15 prototype is actually shown in three previously unpublished photos. Some of the more notable aircraft belonged to JG301 with their colorful RVD bands. Also included is the yellow tailed D-9 of JG26. The two Ta-152 tailed D-9s are included and discussed. JV44’s aircraft are covered in depth and include a couple of previously unpublished photos. The Air Force Museum D-9 is covered in color photos and is a wealth of knowledge, including the upper cowling being camouflaged with dots of RLM 82, instead of RLM 02 as previously thought. This is really exciting as this is new information and the reason we still study German camouflage. Also exciting is the evaluation of “Blue 12” from JG6, including four view drawings. Great stuff, especially for the modeler. A list of the work centers and individual aircraft are included including the history of each aircraft. Very concise and well researched. OK so I’ve talked about the excellent pictures and drawings, but what about the text? Well it is easy enough to read and the English is perfect. Because of the scope of the book the text is more textbook but it is still very easy to read and informative. You will learn more from this book about the camouflage and finishing centers than you thought possible. Excellent work, very informative and very in depth. The end of the book is excellent. There is a discussion of each unit that utilized the Dora. There are no less than four side profiles per unit. This is a nice synopsis of the camouflage. If this isn’t enough to motivate you to build a D-9 then nothing will. It is a veritable cornucopia of the colors and markings of the late war Luftwaffe. A nice touch is a separate painting of a D-9 suitable for framing. I don’t know if they are different from book to book but mine was “Red 11” from 12/JG54. Invariably comparisons between Eagle Editions recent book and this volume will be made. They should not be seen as the same other than covering a basic airframe. Eagle Editions is more oriented to the personal side and the JaPo books are more about the aircraft and the camouflage. I think they both compliment each other and together make for a complete picture of the FW-190D-9. Both are exceptional books and both are worthy of your money. To say that I highly recommend this book would be an understatement. This book is an ESSENTIAL reference document. The authors are to be commended for their excellent work. If you are worried about the cost, don’t. It is worth the price of admission. Buy it. You won’t be sorry. The cost of the book will be nothing compared to the Focke-Wulf kits that you will build. It really is an excellent value for the money. I look forward to the next book. The next book is coming from JaPo with some information including supposed original Luftwaffe color chips from a recently discovered paint stock from WWII. Now that is exciting. Thanks to Ron Boocks from 4+ N.A. for the review copy. You can order your book from him directly at x4plus@verizon.net or by writing him at 855 Bebout Road, Venetia PA 15367, also you can call him at tel/fax: 724-941-8755. If you tell him you read about it from me and this review you will get $10 off the cost.